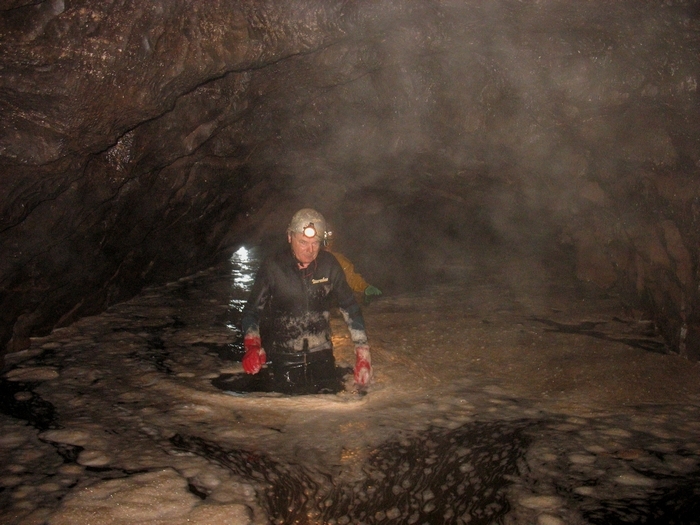 Caving in South Wales is a well-established sport and extends to scientific and archeological study of many of the caves. The limestone forms an arc running roughly from the Gower peninsular, up the Swansea Valley, through the Brecon Beacons National Park and back down towards Newport. Additionally, there is limestone in the Forest of Dean which is covered on another page. The map shows how the best known caves are clustered either in the Swansea Valley (Dan-yr-Ogof, Ogof Ffynnon Ddu [picture below], etc) or around Llangattwg near Abergavenny. Another group near Ystradfellte is active and can easily flood, such as Ogof Nedd Fechan and Bridge Cave [picture to right]. There are caves elsewhere such as in the Gower peninsular but these are less significant although the Gower caves have considerable archaeological value. 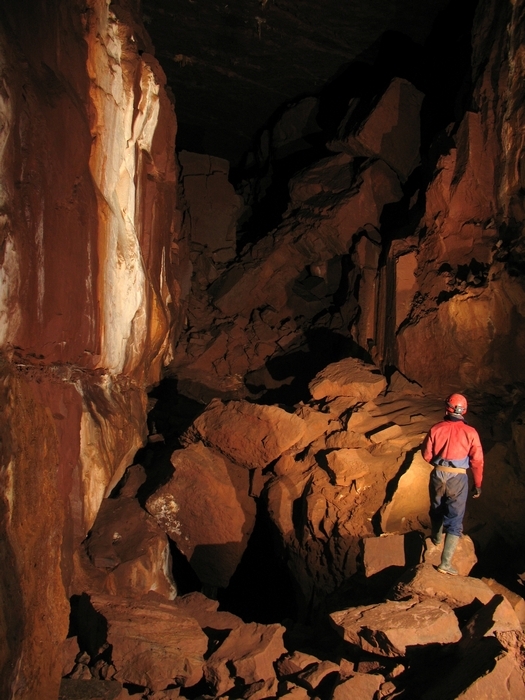 Caves such as Dan-yr-Ogof (15.5km long), OFD (50+km), Agen Allwedd (32+km) and Ogof y Daren Cilau (26+km) have huge sporting value as well as the scientific value. 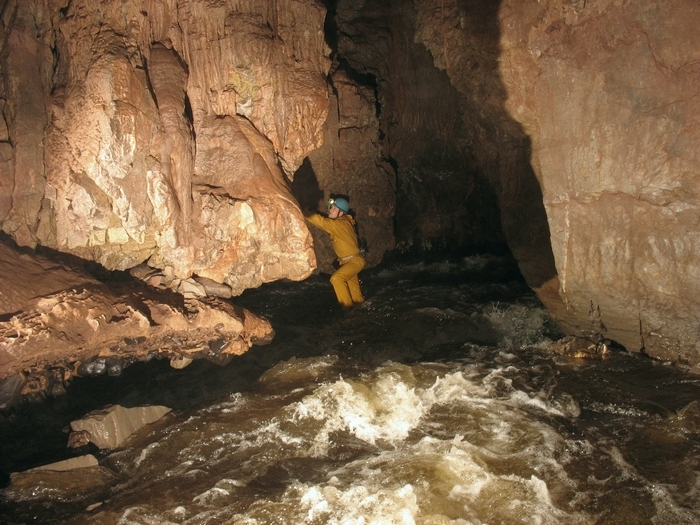 Access to most caves is reasonably easy although some such as Dan-yr-Ogof require a leader and others such as Ogof Draenen are locked. The main caving club in South Wales is, not surprisingly, the South Wales Caving Club which has a clubhouse at Penwyllt with OFD on its doorstep. The Croydon Caving Club is also well known and DCC members have stayed at their hut at Ystradfellte a number of times. Wales is not very well supplied with show caves, the main ones being Dan-yr-Ogof and Cathedral Cave both of them being on the same site along with a range of dinosaurs! Some of the natural caves are accessible to the public without special kit but they are not the main systems. There are plenty of books and journals and a search on the internet will give access to some. The main reference book is still Tim Stratford's Caves of South Wales although this was published as long ago as 1995. The websites such as the guide given below have more or replaced these books. For technical information, the BCRA's Limestones and Caves of Wales is of course the main point of reference.